Before you place your order, send an email to Matt with your ideas/designs/artwork sample attached and we shall let you know if it is possible, with a sample proof. If you're happy with the sample, we will then send you a design ID reference that you will input into the "Custom Design File Name" box and your order will be made to that ID reference. The prices shown are based on a single logo colour and a single background colour. For designs with more than two colours/layers will incure further charges. Do not place an order until you have your unique Design ID reference. IF YOU PLACE AN ORDER WITHOUT A CUSTOM FILE NAME THAT WE PROVIDE YOU, WE WILL CANCEL YOUR ORDER IMMEDIATELY. THERE WILL BE A CANCELATION FEE OF £5.00, IF A SAMPLE PROOF IS THEN CREATE AND YOU THEN SAY YOU WANT A TRADEMARK DESIGN THERE WILL BE A £10 DESIGN & CANCELATION FEE.. This is a set of 4 Round luxury aftermarket custom made 3D Domed Gel Custom made to fit HONDA S2000 alloy wheel center cap badges . Please do not ask for a custom design if it is the TRADEMARK logo, WE WILL REFUSE. 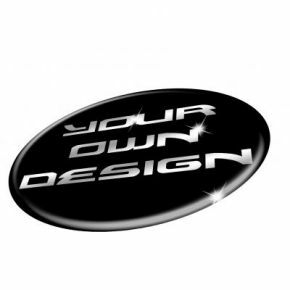 We can however create custom and unique design to your specific requirements. Why not have your name or initials (NOT A TRADEMARK), name, logo or any other Monika. Stand out from the crowd with your very own personalised branding. I bought a set of these with chrome lettering on black background. I sprayed the old centres gloss black to match. They look better than the OEM ones which cost �40 EACH. A set of four decals and a can of paint cost me �20. I saved money and improved the look of my car at the same time. Fantastic product and service. Thank you, Signdezine.